No matter how good a bride is at doing her hair and makeup, she usually picks professionals for the big day. They are the experts, after all, and they know about the latest and greatest products. Plus, life is a lot less stressful for a bride if she charges someone else with the responsibility of making her look her best. In the end, a professional should be able to create looks that are even better than a bride’s best DIY efforts – as long as she finds the right people. There are so many artists and salons to choose from, so how do you find your perfect match when it comes to assembling your glam squad? Rather than trying a few places you found on Google, use this five-step guide to help you track down your ideal partners. If your wedding is close to home, you don’t have to go with your usual hairdresser. “They may be great at cut and color but not updos,” says Melissa Maia, owner of Salon Maia. “Find out how many weddings they have done and whether they enjoy event work.” Maia adds that your stylist will most likely recommend someone else if he or she is not confident with your wedding hairstyle of choice. Also, before you decide on a stylist or makeup artist, start looking for images of the kinds of looks you like, and come up with two or three different ideas. Step 2: Pay attention to first impressions. Step 3: Maximize your hair and makeup trials. Step 4: Understand the financials and logistics. With all the excitement, don’t forget to ask for a full breakdown of costs including gas and parking. 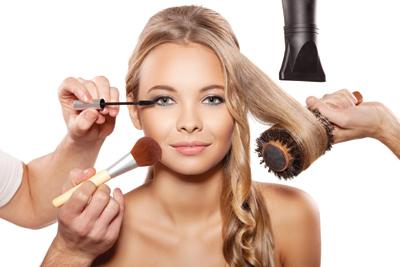 Make sure you know how long your makeup artist and hairstylist will be with you on the day and what would happen should one of them falls sick. Finally, follow your instinct. Can you trust a potential stylist to create the hair and makeup of your dreams? If you and your potential stylist have great chemistry, the relationship will make your wedding day more fun. The perfect accessory to any bridal gown is the gorgeous glow of a spray tan. The potential pitfall, though, is arriving at the altar with a strange orange color with streaks. Try these four spots to get it right. At this full service salon in Metairie, the staff advises brides to have their first spray tan before their makeup application trial to ensure that the skin tones match. The salon’s formula has no orange pigment in it and a discount is available when sessions are bought as a package. You’ll find several ways at this automated spa to achieve a natural color in minutes, such as the PB Glow system and the Mystic Spray Tan. There’s also the Mystic HD, which uses heat for a long lasting tan and a UV-Free AutoBronzer. The skin care line, created by the doctors behind ProActiv, features a sunless tanner. It is easy to apply at home, and contains technology that prolongs your tan, as well as antioxidants to protect the skin. Sip and Spray is 100-percent mobile, so the service comes to you. A day or two before the wedding, this is a fun way for brides to relax with their bridal parties while getting a quick-drying, streak-free gorgeous tan.